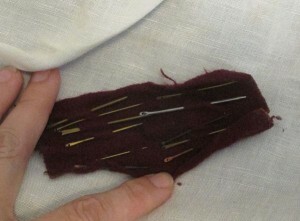 Years ago I made an Anglo-Saxon Sewing kit. It had a tiny knife, needles, three pins, a leather thimble and tread. I made the tiny knife at Pennsic during a class. It was really cool. It has since been lost and I am sad. I did get two more knives made for me but they need some more work, as they do not fit my hand quite right. Anyways I had to learn how to make a needle. I searched all over the internet and did not have any luck. I think that if you are a black smith making needles (and fish hooks) it is so easy you do not write directions. I am not a blacksmith, so I started to experiment. 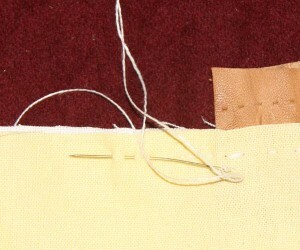 Many bad works later I had a needle that would sew burlap. Time passed and a blacksmith friend told me a trick about masonry nails. They can be cold filed and turned into chisels. That was the piece that I needed to be able to teach a class at Pennsic.